belgear wrote: In a landscape where there are huge titans running around with a giant disparity between biles you want to make gluttony take more work? Still better than ....idk.... say.... nerfing ways to grind purity through floor but leaving legacy humus n stuff ingame and untouched. Don't get me wrong, I had a great time with it. I had access to the good ****, tho. It was more meant in a way of... like the best by far example on how to not do such things. I hope it still serves as a reminder of how half baked game changes play out. JohnCarver wrote: I will continue to wait to see if anybody can show me two recipes where one recipe is significantly better than another from ALL perspectives and situations, and as you pointed out, adjust as necessary when that is the case. Food group reduction chances are the same, full&fed is the same but in case of wild wings gluttony points are better and there is a useful restore slot. Skill requirements are lower for wild wings and it is easier to grow a turkey than to kill a bear. It is also easy to kill an argopelter, but it requires high level skill (Monster hunting). 0.01 kg of pepper is a non-issue. I hope this fits your requirements. 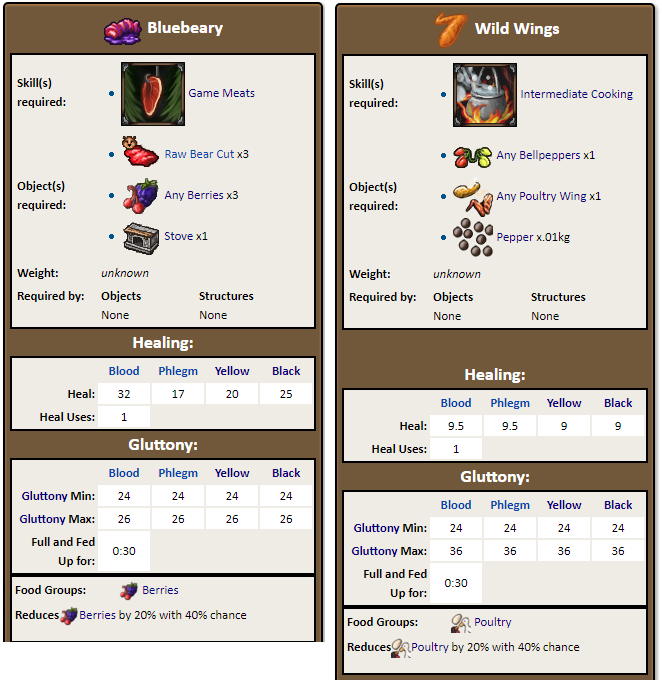 Now, if you nerf wild wings you will destroy one of most useful recipes in poultry group and if you buff bluebeary it will become unreasonably good vs berry cobbler. The other issue is that multiple foodgroups do not have a food recipe that would be competitive with power and versatility of bagels. That applies to: Corn, Bread, Vegetables, Cabbage, Pumpkins. Not sure about fish. Potatoes come close to be competitive but food weight is an issue. Neither Poultry has a similar food, but since there are good fillers in this group it has it's place in gluttony. Recently, in my stall I offered candy restores for corn, pumpkin, bread, vegetables, fish foodgroups at a quite low price and I had few to none buyers. On the other hand I quickly sold a number of marshmalllow chirps (domestic foods) at 5 times higher price. That says a lot both about demand for Domestic Meat group restores as well as about other foodgroups being largely ignored. However, lack of good restores is the only thing that keeps Domestic Meats balanced vs bajgiels, not to mention other, crappy groups and I am against adding a restore before other groups are buffed. one of these 'requires' silver as investment, the other does not. That would be the bigger consideration. Granted its nominal, but there is something to be said for a gluttony session that 'demands' silver and thats essentially what the wings demand and that is why I don't feel they are out of balance in relation to the recipe which does not require silver. There is definitely a demand gap, and I'm still trying to wrap my head around Bajgiels a bit more as I still don't exactly understand how the F&F trade-off doesn't balance them. It does seem there is a great 'issue' with the restores as players seem to be pushing their sessions around restoring through bad rolls, as opposed to using other groups. This a fairly massive undertaking to rebalance food though so I'm skeptical how high this should be on the priority list. JohnCarver wrote: one of these 'requires' silver as investment, the other does not. That would be the bigger consideration. Granted its nominal, but there is something to be said for a gluttony session that 'demands' silver and thats essentially what the wings demand and that is why I don't feel they are out of balance in relation to the recipe which does not require silver. There is definitely a demand gap, and I'm still trying to wrap my head around Bajgiels a bit more as I still don't exactly understand how the F&F trade-off doesn't balance them. So if it demands silver it is ok? So we could have a berry recipe on par with stroganov if it requires silver?! but the FnF is bad and actually is a offset in comparison to other foods. But maybe some people even like the long FnF as it tells them they don't need to do anything for a good while, idk. Shrooms also has (weaker) toppings for combat chars and for bashers, which makes it a bit more convenient to glutton them I guess. Or people just are used to them and need time to adopt new possibilities. Or alternatives are simply lacking behind in the eyes of most people. yet, other food needs some love, and it would be nice to have more than just 2-3 viable foods for higher humors. Taipion wrote: But maybe some people even like the long FnF as it tells them they don't need to do anything for a good while, idk. I don't really like to go through gluttony process quite often. I prefer to do it for good. And my timer is about a weak or so. I'm lazy. Is that actually considered people punishing themselves (taking the long FnF willingly) because of their sins (sloth)?! Boiling and baking 1100 bagels is the worst thing and offsets any nicety they may afford imo.